Ryan Cardona closed out the game strong on the mound and the Red Foxes completed the series sweep. 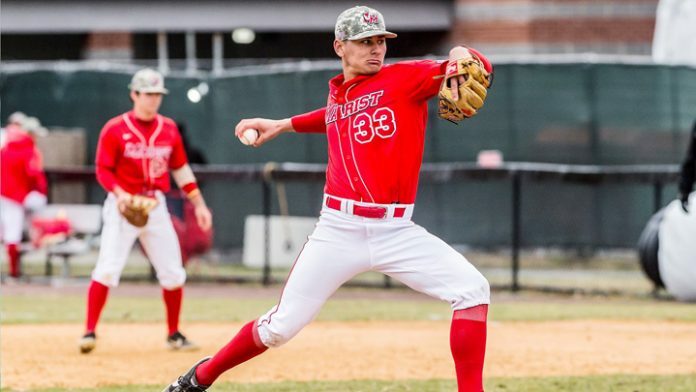 WEST LONG BRANCH, NJ – Marist baseball (13-16, 4-2 MAAC) won the Sunday finale to sweep the series at Monmouth (11-17-1, 2-4 MAAC). Anthony Lazar hit his third homer in two games, and Ryan Cardona closed out the game with 3.2 innings of relief. Anthony Lazar picked up where he left off on Saturday with a home run in third. The Hawks scored once in the third and twice in the fourth to take a 3-1 lead. Robbie Armitage singled through the left side to drive in Lazar and Brian Hart in the fifth and tie the game. Neither team was able to earn the go-ahead run until Brian Hart smacked a line drive to left field to drive in Nick Cantone. Anthony Lazar leads the team with a .336 average and 44 hits, 29 runs scored, 10 doubles and now has four runs. Frankie Gregoire leads the team with 25 RBIs and six homers. Tony Romanelli is the top starter this season with a 3.95 ERA over 43.1 innings with 38 strikeouts. Marist travels to Hartford for a midweek matchup on Wednesday before hosting Canisius on Saturday.